Christian Cardell Corbet is one of Canada’s most renowned artists, art historians and patrons. His portraits and landscapes have provided a special significance for Canadians in understanding an appreciation for our surroundings. He views the landscape with a rhythmic and distinctive character. His works are unpopulated void of figures but on the rare occasion depicts architectural structures. He has taken his place in a distinctive Canadian succession however, he has done so as an individual and without any sense of breaking with his tradition. Corbet was born into an affluent family in 1966 at the former lakeside beach resort of Pickering Beach on Lake Ontario. This location provided him with the ideal setting to develop his talents for painting. He was stricken with acute asthma at the young age and at 14 and he began his informal education in commercial signage under the tutelage his paternal grandfather, and later at the University of Guelph and McMaster University Anatomy Laboratory. In 1994, Corbet moved to Vancouver, British Columbia where he was befriended and influenced by renowned painters such as Jack Shadbolt and Isabel McLaughlin among others. Following his move to BC the urge to travel took Corbet to the United Kingdom where he worked for a short period in watercolours. While in England, he began to experiment more in abstraction and non-objective work. In 1995, his portrait of HM Queen Elizabeth the Queen Mother, presented at Clarence House launched Corbet’s career to an international level. Corbet saw England as “…lyrical and rhythmic in subtle colours much like Canada” which to an extent is his artistic inspiration. He had initially painted a series of paintings in watercolour; however, he was discouraged with the results and destroyed most of them. Studying the work of great artists such as Turner, Rossetti and Ruskin in England, prompted Corbet to revisit landscape painting in 1997. He returned to Vancouver to revitalize his connection with the Canadian landscape but never abandoned portraiture completely. Corbet had been credited as an “…explorer with a curiosity to travel and document how he sees life in line, shape and colour. He loves design.” In addition to exploring the Canadian, North American, British and Channel Islands landscapes, he is also a collector of both modern and historic works by Canadian women artists. He established the Corbet Collection of Canadian Women Artists (CCCWA) in the 1990’s. Corbet’s experience with abstraction gives his recent works a strong feeling of the flux between time and space and with a sense of movement and calm. These works depict an awareness of the moment, power and immediate presence such as his popular iceberg works. Having lived in four provinces and dividing his time between Newfoundland, Canada and the UK, he has a keen sense and true experience with each destination he has visited. Not limited to two-dimensional works Corbet has also gained international acclaim for his art medallions and portrait busts for which many depict notable world figures whom are now friends of Corbet’s. Some of his many famous subjects include Margaret Atwood, Dame Jane Goodall, Col. Geo. Stanley, Admiral Sir Charles Kingsmill, HM Queen Elizabeth II and HRH The Prince Philip, Duke of Edinburgh among many other notable personalities worldwide. Corbet’s medallions are yet another facet of his ability to both paint and sculpt, a rarity for most artists. He has also gained international recognition as a Forensic Artist working as Artist in Residence for the University of Western Ontario where he creates forensic facial reconstructions for special assignments. His most recent reconstruction was for the Department of National Defense aiding in the identification of a WWI soldier. He recently completed a forensic reconstruction of an Egyptian Mummy from the Royal Ontario Museum. Corbet’s art can be found in many distinguished permanent collections, some of which include the Imperial War Museum; Aberdeen Art Gallery & Museum; British Museum; Canadian War Museum; Dept. of National Defence – Navy Headquarters; National Museum of Ireland; and the Numismatic Museum in Greece as well as the world famous Rijksmuseum, among over 90 other important public collections worldwide. Christian Corbet is the Founder and Past President of the Canadian Portrait Academy (CPA), Founding Member, and President of the Canadian Group of Art Medalists (CGAM), Member of the British Art Medal Society (BAMS), and Member of the Federation on International Medalists (FIDEM). He is also a Fellow of the renowned Royal Society of Arts, UK (FRSA). Corbet’s career is cited in numerous international publications to include “Who’s Who in Canada”; “Canadian Who’s Who” among other biographical and fine art related publications. In 2012 Corbet was awarded the Queen Elizabeth Diamond Jubilee Medal as well as Grant of Armorial Bearings and Badge from the Crown. In the same year he was bestowed the title and appointed the first “Sculptor in Residence for the Royal Canadain Navy”. In 2013 Corbet was commissioned by The Royal Canadian Regiment to sculpt an official portrait bust of HRH The Prince Philip, Duke of Edinburgh, KG, KT. Corbet became the first North American to have sculpted Prince Philip from life-sittings at Buckingham Palace. In June a private unveiling of the portrait bust was held at Canada House where HRH Prince Edward Duke of Kent bestowed upon Corbet the Honourary Title of “Regimental Sculptor for The Royal Canadian Regiment” a first ever appointment of its kind in The Regiments 130 year history. In 2014 Prince Philip invited Corbet back to Buckingham Palace to present a second edition of the same portrait bust which The Duke placed into the Royal Collection. Corbet is currently sculpting authorized and portraits of LGen Romeo Dallaire, Farley Mowat, Dr. Brenda Milner, among others. Corbet is currently sculpting Andrew Douglas Alexander Thomas Bruce, 11th Earl of Elgin and 15th Earl of Kincardine, KT, CD, DL, JP as well as sculpting a ground breaking forensic facial reconstruction of King Robert the Bruce, this reconstruction helps rewrite Scotland’s history. Christian Cardell Corbet is widely considered one of Canada’s most sought after portrait artists, benefactor to the fine arts and Canadian fine art historian. It is believed that he is the most represented Canadian portrait artist to have ever hailed form Canada. For more information, visit his website: www.christiancorbet.com. We also invite you to “like” the facebook page: Elizabeth Bradford Holbrook Sculptor. She has over 600 followers and it would be great if we could promote the restoration project on that page too. DUNNVILLE—A long-awaited Dunnville project gets kicked off on April 29, 2017.
together to see a dramatic facelift executed on Centennial Park. completed in 1967 to commemorate Canada’s Centennial. working to refurbish the town’s mascot and most recognizable landmark. by September 23, 2017 to coincide with a public rededication celebration. Thank you, thank you, thank you! I can’t thank you all enough for the outstanding team effort. 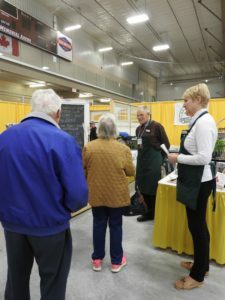 You helped to make the 2017 Lions Home, Garden and Craft Show a HUGE success for the DHS!!! I especially want to recognize Petra who helped organize the event and contributed so much of our booth decor. In addition, Petra donated the raised garden box and 2 bags of compost. Thank you Petra! Thank you to our set up team who quickly got things organized and ready to go on Thursday afternoon before the busy evening program night. Thank you Donna Cavers for once again lending us your easel and chalkboard. Thank you Margaret Bottrell for coming through with seeds for us to hand out! Thank you Wray and Bev for bridging things between DHS and the Lions, since you wear both hats. We are so grateful for all you do! Thank you to everyone who manned the booth for the long hours of the show itself…Nelly, Susan, Steve, Ellen, Svetlana, Kim, Mary Lou, (hope I haven’t missed anyone!) Your friendly interaction with the public made me feel so proud! Debbie T, Petra, Denise, Gloria, Rob and Sandi…you guys were there for most of those long hours sharing with so many people the DHS story….thank you! It’s because of you all that DHS is proving to be the biggest club in Dunnville!!! 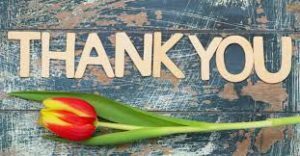 We heard so many thank you’s from our Dunnville friends and neighbours, all glowing about how beautiful we make our town look, and how they love what we contribute to our community. You should all feel great! You are the face of the DHS and you represented our Society so well!!! Also, I would like to say a huge thank you to Marlene, Sandi and Lester who provided their mini-demos in such an engaging and entertaining way! So many great comments from your audience. Next year’s addition will be the cordless microphone and a small speaker to amplify your voices. We continue to create many networking opportunities at the Lions Show as well, which opens up new avenues for future speakers, fundraising opportunities and other ideas and improvements. 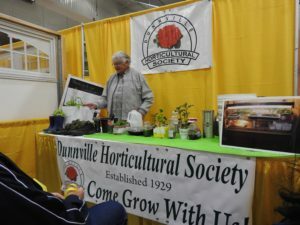 All in all, it was a super weekend for the Dunnville Hort Society! I am so grateful to you all for everything you have done to make this year’s event another great one for our Society. Thanks to you all! Spring is one of the most important times to perform maintenance to your lawn. We all enjoy a beautiful lawn which can be achieved inspite of the drought and heat our summers offer. Although we don’t know what 2017 will bring, spring is the perfect time to prepare our lawns for the season ahead. Remove any debris that has accumulated over the winter months. Rake up any matted areas of the lawn. Raking these areas and removing debris will encourage better air flow throughout the turf grass and prevent any disease and insect infestation. It will also allow new grass blades to grow without struggle. Fertilizing your lawn in the spring jump starts it from its winter slumber. It provides a nutrient build-up that will give it the strength to withstand heat stress and drought through the summer months. Winter can wreak some havoc on our lawns with damage caused by salt and snow plows. Spring can be a great time to re-seed any damaged turf areas. Jeff Ronhaar from Jeff’s Lawn Care Inc., Binbrook will provide more tips for growing and maintaining a healthy lawn on April 20, 7-9pm, at the Dunnville Horticultural Society (DHS) Program Night. Jeff will share ideas on: Watering: should I? How much? How often? Mowing: How often? What length? Fertilizer: organic vs. granular? When? What kinds? Spring lawn preparation: should I thatch? Pests and Diseases to watch for and how to treat? 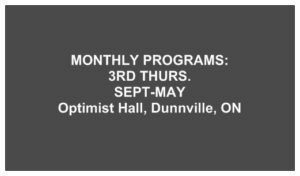 Everyone is welcome to this free event at the Optimist Club Hall, 101 Main St., Dunnville. Since 1994, Jeff’s Lawn Care Inc. has been a premier Landscape Contractor in Haldimand County providing landscape design, installations, maintenance and lawn care to a loyal customer base. 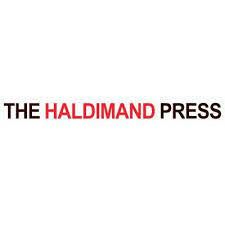 They have won 32 industry awards to date and enjoy their community involvement. For more information, call Debbie Thomas, DHS/Garden Club President (905) 774-3064 or Deb Zynomirski, VP (416) 556-9337. A Big Thank You to Steve Elgersma, Rob Marr, Gloria Hunter, Marilyn Stavinga, and Denise Richardson for joining me this morning to prepare our town beds for spring planting. and soil worked. Rob Marr hauled away the plant material on his trailer. We all still took time after for coffee together. It couldn’t have been nicer weather or company. Here’s a way to make Father’s Day extra special! By following a few simple suggestions, it’s very easy to have new, red potatoes for your Father’s Day dinner. Begin by buying some Norland potatoes. Increasingly, garden stores are stocking them. Usually they are available at Canadian Tire Stores by April 15-20th. Norland are the recommended variety as they mature in 70 days vs. 100+ days for other varieties however, they do not produce as many potatoes per hill. To “get the jump” on the season, start your spuds indoors after the middle of April. Cut the potatoes leaving at least two eyes per piece. Allow them to dry for a couple of hours then plant each piece individually in a compostable paper cup with potting soil. Water and place in a warm, lighted place. Sprouts will probably appear within a week. When the weather begins to warm up in late April or early May, transplant your plants into your garden. If you want a large quantity of small potatoes, you can plant each hill 6-8 inches apart. Work some fertilizer into the soil beside each plant. To create a greenhouse effect, remove the bottom of a plastic juice container placing it over each plant. On warm days, remove the cap which also facilitates watering. If frost is predicted, cover the jugs with a generous amount of leaves. Remove the jug only when the weather warms up. Sometimes, it may take a couple of days. By the third week of May, the jugs can be removed permanently. Hill up around each plant. Because it is early in the growing season, you will not have to contend with potato beetles. This year Father’s Day falls on June 11th. Hopefully many gardeners and readers of this simple suggestion can report they harvested new, red potatoes for this special day! “It’s no April Fools Joke!”……. 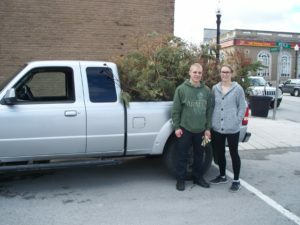 On Saturday April 1 DHS President Debbie Thomas along with two high schools students removed Christmas decorations from over 20 planters and pot displays in downtown Dunnville….. would you believe over 3 truckloads were hauled away??? “A Really Big Thank you from DHS” goes out to Ethan Thomas from Dunnville Secondary School and Dakota Labelle from Conseil Scolaire De District Catholique Centre Sud. DUNNVILLE—Without the initial spark from our school children and the staff at Dunnville Christian School the community fountain refurbishment project would likely never have developed. The Dunnville Lions are proud to be on the list of supporters from last year and again this spring. Fifty years ago, the citizens of Dunnville commissioned a fountain to be erected in Centennial Park to commemorate Canada’s 100th anniversary. 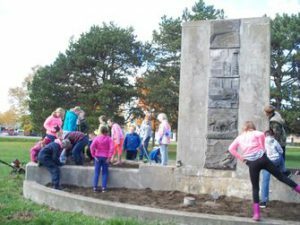 This year, the badly neglected memorial is being given a facelift and needed structural repairs thanks, in a large part, to the grades 3 and 4 students from Dunnville Christian School. The staff and students took an interest in the history of the fountain last year and began raising money for the repair. Since, they have partnered with the Dunnville Horticultural Society and with financial support from the community the plan is to have a rededication of the monument this September. It certainly is encouraging to see our youth taking the initiative to build our community. They deserve a huge thank-you. Bob Hansen is a member of the Dunnville Lions Club. DUNNVILLE—The Dunnville Lions club donate a cheque for $1,000 to the Dunnville Christian School group at a small ceremony beside the fountain. Adults present in photo (not shown) included: Beverley McLean of the Dunnville Lions, Lions President Hank Kerkdyk, Margaret Kamping of the Dunnville Christian School and Lions secretary Ted Tomlin.